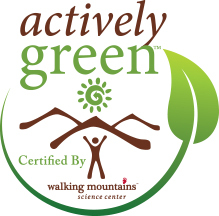 The Actively Green Program is a sustainability coaching and certification program administrated by Walking Mountains Science Center. The program trains businesses within Eagle County, Colorado on sustainability best practices and is designed for any type of business. good business. Be a community leader and become an Actively Green certified business! The Actively Green Standard is a set of industry criteria recognized by the Global Sustainable Tourism Council. This supports the efforts of Vail, CO as the first certified sustainable destination in North America. Please feel free to provide your comments and suggestions for improvements here.